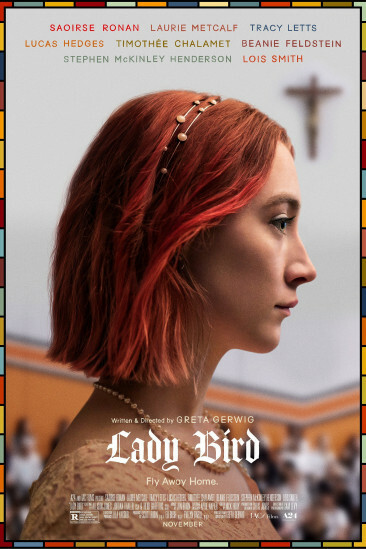 Lady Bird tells the story of Christine "Lady Bird" McPherson (Saoirse Ronan), a high school rebel who cannot wait to graduate and move as far away from her family as she can. Her mother Marion (Laurie Metcalf) loves her but she can be a little overbearing with her parenting at times and her father (Tracy Letts) usually just stays out of most things because he doesn't like confrontation. The story follows her as she goes from being somewhat of an outcast at her school to two relationships with boys and working her way up to be one of the popular kids. All this while stirring up her own trouble at home with her family. The story here isn't anything you haven't seen before, it's your basic coming of age story. You have a character who is different from the masses but wants to fit in and tries to do so by acting out. Thankfully, director and writer Greta Gerwig knows how to get the right emotions out of the actors involved and puts together a rather telling story that most viewers should be able to identify with in most aspects. It's more or less like watching a real life story take place on screen which some may call boring but when done right, like it is here, you get a look into a troubled teenager and her struggles with everything around her. Having an extremely talented cast on board helps in telling a good story and the cast here does just that. Saoirse Ronan has been consistently putting out good performances since she was about 13 and her performance as Lady Bird may be her best yet. The biggest surprise in the cast however is Laurie Metcalf who you may remember as Aunt Jackie on the sitcom Roseanne. Her performance as Marion should get a lot of attention this awards season as she gives one of the best performances as a mom in quite some time. Everyone else who gets notable screen time including Tracy Letts, Lucas Hedges and Beanie Feldstein all do well in their roles respectively. There wasn't much here not to like. The performances by some of the actors playing the "cool kids" felt like they were trying just a little too hard. Some scenes can be somewhat hard to watch just because of how real the characters are portrayed but that's also one of the strengths here as well. You could nitpick small things here and there but at the end of the day this is a strong film in almost every aspect. This film will hit you with every emotion. You'll laugh, you'll cry, you'll get angry and there's even a few surprises along the way. One things for sure, this is without question one of the best films of 2017.